Questionnaires let you create a list of questions of several different types to ask your supporters, then record the answers and data they provide. Questionnaire answers, although they are available for browsing and export along with their respondents' information, are not custom fields and are not retrievable elsewhere in the system. For this reason, questionnaires are most useful when collecting information in bulk from many supporters, rather than collecting individual information. We recommend using custom fields to collect data that you will need to add to your individual supporters' records. Reference Name is entirely an internal name, invisible to the public. Use organized, specific titles such as 2014 Yearly Surveyto make sorting and locating easier. Description allows you to describe, contextualize, or frame the Questionnaire for your users. This field appears on the Questionnaire after the Title, and can be HTML-styled using the WYSIWYG editor, including images, links, and video embeds. Status decides if the page is visible to supporters. Active will allow supporters to fill out the form while setting the status to Inactive or Archived un-publishes the Questionnaire for end users, closing it to further replies. However, you'll still have the Questionnaire (and any response data it's accumulated) stored in your Salsa headquarters. Deadline allows you to set a date (in YYYY-MM-DD HH:MM format) after which the Questionnaire will automatically reset to status Inactive (see above) and collect no further data. Target Number is the number of responses you hope to garner from the Questionnaire. Used strictly for record keeping purposes. The Questions tab is the meat of the Questionnaire tool, where you can configure special questions unique to each Questionnaire to solicit supporters' views on any subject. To get started building a new question, click the +Add Question button. The first three fields are used to describe the question to your Questionnaire respondents. Each field is optional, but you'll want to use at least one of them. Question Header appears before the question. Question Label "wraps" the question (and if applicable, its possible answers). This is your actual question. Question Footer appears below the question. For Questionnaire questions of type such as Dropdown and Radio Buttons, where you'll be providing respondents a menu of potential choices rather than an open-ended question, you can define one or more potential Answers to select. Just click the "Add Answer" button to create one new possible answer ... and repeat the process again for the second answer, and again for the third answer, and so on. The Answer field defines the way your question will be recorded in the database. This field is now required in the creation of a question, because previously if it was left blank it would damage later data collection and reporting. Answer Label defines the way each individual answer will be described in the public interface to Questionnaire respondents. This field is not required--but is, in most cases, essential. Your answers won't show up on your page if you don't have a label. There are also "short label" and "short answer" options, which are there to make reading lengthy answers in your "responses" tab easier. Checking the optional Default button (unchecked by default) will cause the answer to be the default, pre-selected answer to its associated question on the end-user Questionnaire form. However, it is not necessary that you designate default answers, and you might often prefer not to do so. Check the "Required" box (unchecked by default) to make the question required. 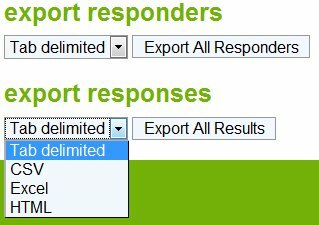 As the name suggests, the Export tab provides a couple of simple options for exporting your Questionnaire results. You can choose to export either the Responders, which provides supporter data only, or a full set of their Responses. For either option, just select a data export format from the menu, and then click the adjacent Export button. what emails (if any) are automatically launched by the signup. This field allows you to specify the web address to which your registrant will be redirected after completing the page. This could be your website’s homepage, a donation page, a tell-a-friend page, or literally any other page on the web. You could even use Salsa's Website Management tools to design a special landing page that tells the registrant to expect an email from your organization, or provides a welcome package. An alternative to a specified redirect path, checking Show Results will instead redirect Questionnaire respondents to an automatic Salsa page confirming the Questionnaire responses. 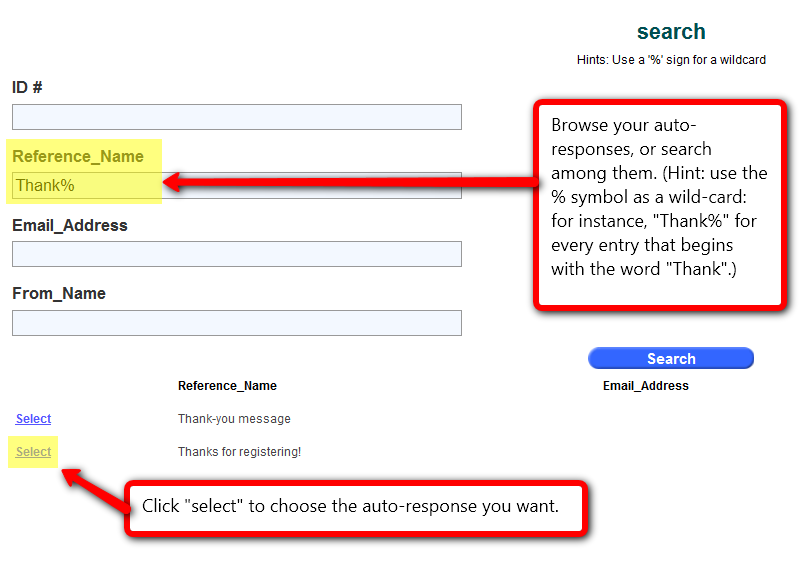 "Autorespones" or "Triggers" are email messages launched as a result of someone completing the signup page. Though Autoresponses are optional, they are highly recommended; almost any page will benefit from having at least a simple confirmation email sent to your supporter. 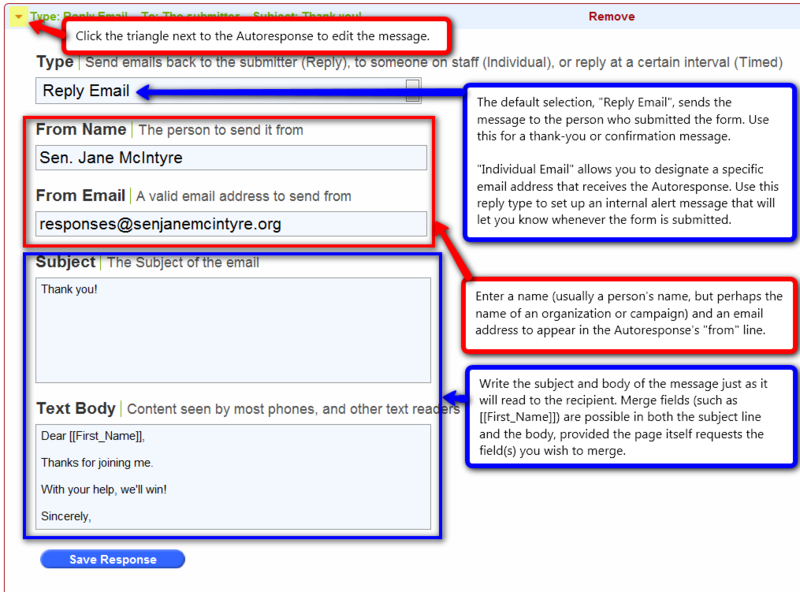 Additional Autoresponses (there is no limit to the number of Autoresponses a page can launch) can also be used to email an alert to someone in your own organization, so you'll know immediately whenever someone completes the Questionnaire. Set as a Reply Email (delivered immediately to the person who completed the Questionnaire), an Individual Email (delivered immediately to a designated third party), or a Timed Trigger (delivered after a set delay to the person who completed the Questionnaire). Note that Questionnaires have special merge fields available if you want your autoresponse email to include a complete set of questionnaire questions and the user's responses. Is there any plan to revise the way Salsa exports Questionnaire data? I am baffled by the "vertical" response export format. One row per respondent, with columns to represent the questions, makes much more sense and would be extremely helpful. That is actually a feature request that has been submitted to our developers. While I can't say exactly the time frame, it's certainly something that is on their radars for development. Thanks for the suggestion! How can we re-format multiple check box answers and radio button answers? We would like to show each possible answer on one line. Right now, some lines include multiple answers and check boxes, while other lines include only one answer -- so the check boxes don't all line up. It's confusing when you're trying to find the right box to check. Thanks! That's a great question for Salsa Support (support (at) salsalabs.com). There may be some template tweaks that can be made with CSS to change the display formatting, or our Support team can put you in touch with one of our great partners for additional design help as needed. Where is the link to Questionnaire Builder located? If it's an additional module, then where can I find documentation about how to add questions to a signup page for a "simple survey"? The help page at https://help.salsalabs.com/entries/23173056-Simple-Survey-tool loses me at step 6. Thanks. To create new page versions, click on "Questionnaire" or "Simple Survey" and then click on "add new". That should bring you to the specific page workflow where you can customize your page. If you have any followup questions, please send a ticket to Salsa Support (support (at) salsalabs.com). Is it possible to configure a questionnaire so that a respondent can take it more than once? Is it possible to configure a questionnaire so that a respondent can return to add to a response previously given (in a multi-line text field) or change a previous response? Is it possible to delete individual records? At present the only options appear to be 'delete all' or 'delete prior to a date'. No, it's not possible to allow respondents to answer questions in a questionnaire more than once. Yes - respondents can change their previous responses if they return to the same questionnaire. As a caveat to that - I tested this feature just to be sure and the updated responses do not display correctly on the responses tab for all question types, but they are all always correct/updated when responses are exported. As for the third, it's not possible to delete individual responses. You could, however, export the responses to Excel and filter/sort/or delete the ones you want from the spreadsheet. I designed a questionnaire. The first question was configured with a text response. When I viewed the questionnaire, the only response option was a pulldown with the title of the question as the lone answer. I reconfigured that question with a multiline response and saved it. I viewed the result and it displayed the multiline text option. I am being forced to use the multiline option because I can't figure any way to get the text option to work and need this for tomorrow. Bummer!!! Questions of type = text, by definition, are open-ended and do not have answer choices. To add a text question, simply type the question prompt in the Question Label field and select Text from the Question Type drop down list. This creates a single-line text field into which Supporters can type their question response. Note: If you'd Supporters to have multiple lines in which to answer the question, follow the same instructions, but select question type = _Multi-Line Text _from the drop down list. Hi, it looks like the answer is no, but can you create a custom short URL for questionnaires? You're right - short URLs are not available for questionnaires. I've updated our Short URL documentation accordingly - thank you! Is it possible to create answers for one question that are in different forms? For example, I want to use the Radio Button option for my answers but I'd also like to have my final answer option be "other please specify" with a text box where a person can write in their response. Is this possible? Please let me know as soon as you can! We want the functionality of the simple survey: Add tags to users based on their answers to questions - with the robustness of questionairres: drop-down lists, etc. Is that possible? Otherwise how does one use the data from questionairres to sort users accordingly?